Few writers have affected me more than Devin Grayson. I was inspired by her ability to break into the offices of DC Comics with (of all things) fan fiction. Then I followed from from book to book, enjoying her adventures with Nightwing, Arsenal, the Titans, and most of all Catwoman (her Catwoman run is still one of the seminal ones, as far as I'm concerned). And I was lucky enough to "meet" her online and find her just as warm and real as the characters she was able to put onto the page. So it's with great honor (and a bit of pride) that I share this interview with one of my favorites, Devin Grayson. The two latest projects I’ve been involved in are very special to me, and happily, both are ongoing. 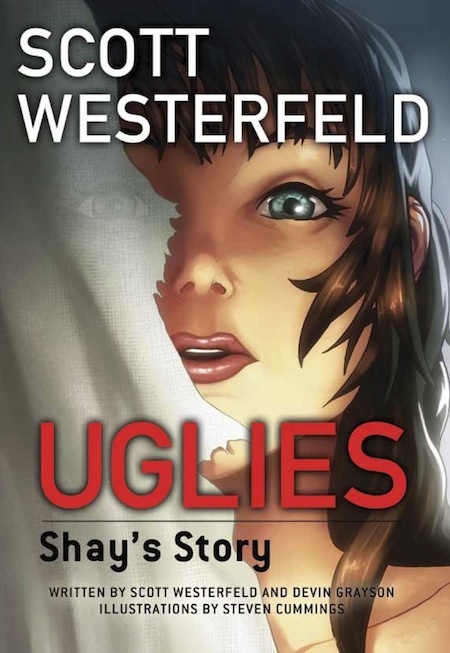 The first, UGLIES: Shay’s Story, is a manga-style graphic novel with artist Steven Cummings based on Scott Westerfeld’s NY Times best-selling YA Uglies series. For readers unfamiliar with Scott’s series, our graphic novel is a great jumping on point, but for the myriad of rabid fans already in Camp Westerfeld, it’s an exciting re-telling of the story through a secondary character’s point-of-view. The book was released last month through Del Rey and has already positioned in the top ten of the New York Times paperback graphic novel bestseller list. That’s probably old hat for Scott, but it’s pretty exciting for Steven and me! And Steven is finishing up the inking on the second graphic novel in the series, UGLIES: The Crims, right now—so more fun is coming! The second project, Womanthology, hopefully needs no introduction. In addition to being a historically successful Kickstarter comics project, it should by now be everyone’s favorite example of creating space and experience for new artists. 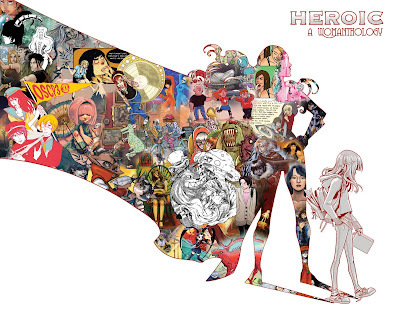 I couldn’t be more excited about and proud of the finished project—Womanthology: Heroic—and am already hard at work on a contribution for the all-new upcoming Womanthology: Space. My work is about how we define family and how our families define us. It’s not something I consciously set out to do, but I find myself constantly circling themes about the ways in which family sustains and deprives us, bolsters and traps us, how it influences our sense of identity and our range of social interactions, both for better and for worse. If you ask me about family in my day to day life, I’ll reflect on my current situation and share how fortunate and gratified I feel. But we all have two families – the one we’re born (or adopted or relinquished or welcomed) into and the one we create. And that first one…man…. I’m incredibly fortunate and love and feel very close to my parents, but in my work, family often shows up as a problematic obligation or some kind of shackle to escape. Family lights our way but in so doing, also casts one hell of a shadow. Well, in comics, I’ve already done it. 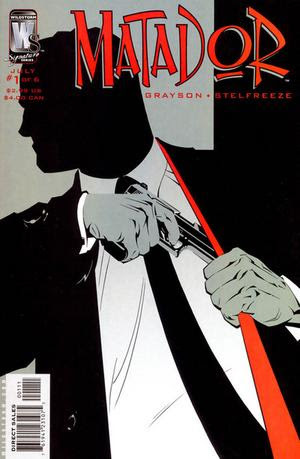 I came into the industry specifically to work with Batman and his family, and I got to do that all the way to the point of being allowed to run with Nightwing and create my own ongoing Bat-series. And then I got excited about being able to do some creator-owned work, and I was able to do that with two of my favorite artists; John Bolton on USER and Brian Stelfreeze on Matador. There are still a gazillion projects in the medium that excite and inspire me, but most of my dreams in the industry have already come true. So these days my dream project is a prose series. I have one I’ve recently developed that I’m currently showing to a few publishers and agents, but any chance to work with a tight group of characters in an ongoing prose series would rock my world. 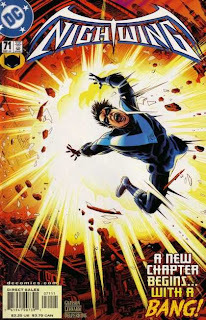 Well, I loved every minute on Nightwing up until the very end, when my ambitiously long story-arc dovetailed (or, more correctly, torpedoed) into a huge cross-over event. I’d worked through events like that before, of course, but that time my story and the event in question were on diametrically opposed trajectories. Right when I was all set to have Nightwing save Blüdhaven and completely redeem himself, the people driving the event needed to bomb the city to smithereens. If I had it to do over again, I would keep my storylines shorter and tighter. I feel bad about the way that one ended. There were a lot of plot lines I didn’t get to tie up and issues to which I did not have a chance to bring closure. Ooh, good question. I’m really not sure—it’s kind of a compulsion. Though it’s indescribably wonderful to have readers, I’d do it even if none of my work ever saw the light of day. I suppose in many ways it’s how I process the world. My nonfiction writing is usually aimed at either teaching or learning something (I know of no better way to learn about something than to research and write about it), but fiction writing is a kind of meditation; an exercise in turning reality into truth. At a simpler level, I come to love the characters I write about, and as they’re fictional beings, writing is one of the best ways to spend time with them. Probably, at some level, every single piece I’ve read has influenced my writing. But the first writer who inspired me to deliberately try to incorporate some of her style into my own was Anne Rice. Her love of her characters comes shining through, and her descriptive abilities are enthralling. Some of my favorite writers are Haruki Murakami, Nabokov, Milan Kundera, Rilke, A.S. Byatt, Jeffrey Eugenides, Steinbeck and Alessandro Baricco, but I don’t think my writing is anything like any of theirs. I deliberately read a lot, and a lot of very varied material, to make sure I don’t fall into another author’s cadence when I’m writing, but more often I find it works the other way; I’ll read something and feel a sense of kinship, like, “yeah! This is my kind of writing!” I’m nowhere near as strong a plotter, but Laura Joh Rowland’s Sano Ichiro novels are like that for me—not that I feel I could have written them, exactly, but more like I feel that I know how she feels when she’s writing them, and I experience that joy as well as the joy of discovering the story as I go through the books. In comics, it’s all about who I’ve learned from, and that list is long. The people who work in comics are, by and large, incredibly generous about sharing what they’ve learned about the medium and it would take me ten pages to thank everyone who’s made themselves available to me. But the top of that list would have to include Mark Waid, Denny O’Neil, Scott Peterson, Scott McCloud, Jay Faerber, Brian K. Vaughan, Alan Moore, Chuck Dixon, Greg Rucka and Brian Stelfreeze, not to mention every editor and artist I’ve ever worked with. But then, is writing an art? Only when done extraordinarily well, right? Shakespeare=art. My fan-fic? Not so much. Writing is a medium, and what we do with that medium is as diverse and unpredictable as we are. As usual with publishing, I can’t talk about the stuff I’m working on right now. But I hope readers are enjoying UGLIES: Shay’s Story and Womanthology: Heroic and stay tuned for UGLIES: The Crims and Womanthology: Space. Thanks! To learn more about Devin and her work, visit www.devingrayson.com. Thanks. We still need to do yours. PRO SE PRESENTS SONS OF THOR! [Link] RES IPSA LOQUITUR, OR DOES IT? Upcoming Book Signing in Rome, GA.